their purple to black color. Agricultural Research Service scientists recently made headway unlocking the secrets of Black Magic—a commercial eggplant cultivar representative of U.S. market types. Apparently, when horticulturists named it, they were onto something. Turns out the variety has nearly three times the amount of antioxidant phenolics found in other eggplant cultivars that were studied. Geneticist John R. Stommel of the ARS Vegetable Laboratory and plant physiologist Bruce D. Whitaker of the Produce Quality and Safety Laboratory, both in Beltsville, Maryland, have teamed up to evaluate the amount of antioxidant phenolic compounds in a wide variety of eggplants. They've found that different genetic lines, or accessions, have dramatically different levels of phenolic acids—which in addition to having nutritive potential, give rise to browning of the fruit flesh once it is cut. Polyphenol oxidase is the enzyme that makes phenolics react to form brown pigments. The team knew that some eggplants had previously been found to be high in phenolic acids—a class of phenylpropanoid compounds, such as flavonoids, that have a single phenyl ring and one to three phenolic hydroxyls. Plants form these compounds to protect against oxidative stress, as well as infection by bacteria and fungi. First, Whitaker established procedures for analyzing the phenolic acids in eggplant—extracting them from eggplant required care to avoid their oxidation. Once they were extracted, the scientists used three analytical methods—HPLC, LC-MS, and NMR—to separate, measure, and identify the compounds. The team began their study by using the methods to measure the phenolics in seven commercial varieties of eggplant. 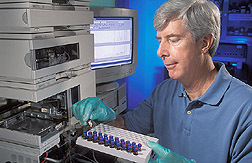 Then, they measured the levels and types of phenolics in a broader test sample. "We thought it would be useful to test the potency of eggplant cultivars that are commonly grown and consumed in this country," says Whitaker, "But we also hoped to find traits from a broader genetic sample that might be worth introducing into popular commercial cultivars." They turned to the ARS National Plant Germplasm Center (NPGC), located in Griffin, Georgia. NPGC's mission is to preserve and characterize the germplasm of both cultivated and wild relatives of particular crops. Plant germplasm contains all the genetic information for a plant's hereditary makeup. Such genebanks are a rich source of plant material that can be used in developing improved varieties of crop plants. 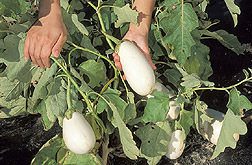 NPGC gave the scientists seed samples of 115 different types of eggplant. That group is known as the eggplant core collection because it represents the genetic diversity of NPGC's complete collection of more than 770 eggplant varieties. Some of NPGC's eggplant germplasm was collected from southeast Asia, and some of the wild species came from Africa. Each had to be planted and grown before testing. "We were impressed with the diversity we observed among plants within the collection," says Stommel. "We found a wide variety of fruit shapes, sizes, and especially colors, including green-, yellow-, and red-pigmented types along with the more common gradations of black to purple." From the study evaluating the 7 commercial cultivars, the team found 14 phenolics—mostly derivatives of caffeic acid. "But there was a significant difference in the content of these 14 phenolics among fruit of the 7 cultivars, as well as in stem, middle, and blossom-end tissue segments from individual fruit," says Whitaker. Overall, the scientists found chlorogenic acid to be the predominant compound in all the samples analyzed. The finding is significant because chlorogenic acid and related esters of caffeic acid are among the most potent free radical scavengers found in plant tissues. Benefits reported include antimutagenic, antimicrobial, anti-LDL, and antiviral activities. Still, while the studies conducted have helped characterize the content of phenolic acids in various eggplant accessions, the scientists have more to learn. "We need to find out whether and how various phenolic acid levels affect flavor," says Stommel. The current evidence indicates that phenolics in eggplants are good for people, but they may also impart a bitter taste. In theory, eggplants with the highest level of antioxidants also taste the most bitter. In the future, the scientists want to help define eggplants with an optimal balance of phenolics to ensure both high nutritional value and consumer acceptance. "We don't want to develop something that is so bitter that people won't like it," says Stommel. As the scientists learn more about the genetic traits of the various accessions, they expect that traits from some of the wild species may eventually be bred into cultivated varieties for health purposes. In the study involving the eggplant core collection, two phenolic compounds that had never before been identified in plant tissue were found in a wild eggplant species. "We need to confirm the identity of these compounds with further analyses," says Whitaker. A consumer evaluation, together with data from the larger study, could be used in choosing parental lines for producing improved varieties. The goal of such a program is to establish new breeding lines and then release them to the commercial seed industry for development of finished varieties that will benefit consumers. 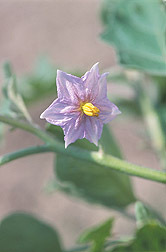 "Ultimately, we want to help develop eggplant cultivars with improved phenolic acid composition as well as improved taste," says Stommel. This research will help identify desirable traits for cross-breeding—or what scientists call introgressing—into existing adapted germplasm. The findings were published in the June 2003 issue of the Journal of Agricultural and Food Chemistry and the September 2003 issue of the Journal of the American Society for Horticultural Science.—By Rosalie Marion Bliss and David Elstein, Agricultural Research Service Information Staff. This research is part of Quality and Utilization of Agricultural Products (#306) and Genetic Improvement (#301), two ARS National Programs described on the World Wide Web at www.nps.ars.usda.gov. John R. Stommel is with the USDA-ARS Vegetable Laboratory, Bldg. 010A, 10300 Baltimore Ave., Beltsville, MD 20705-2350; phone (301) 504-5583, fax (301) 504-5555. Bruce D. Whitaker is with the USDA-ARS Produce Quality and Safety Laboratory, 10300 Baltimore Ave., Bldg. 002, Beltsville, MD 20705-2350; phone (301) 504-6984, fax (301) 504-5107. Everyone Knows What an Eggplant Is...Right? Most people have probably tasted an eggplant. You may have been in an Italian restaurant where chefs use the purplish fruit (like a tomato, it is botanically classified as a fruit) in the popular dish eggplant parmesan. But maybe the eggplant used wasn't purple. Maybe it wasn't even teardrop shaped. Eggplants come in hundreds of shapes and colors. But the fruit probably got its name because some small-fruited, white-pigmented eggplant varieties look like chicken eggs. 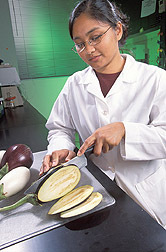 Griffin, Georgia, is home to USDA's eggplant collection, which includes 770 different accessions collected from around the world. While nontraditional ones may not be available at most grocery stores, they are often found in gourmet and ethnic food stores and local farmers' markets. to those of potato and tomato. (K10935-1) Eggplant is much more popular outside the United States, particularly in India (where the first eggplants supposedly grew) and other Asian countries. In India, many people eat small, round eggplants. Some enjoy eggplant cooked and served with other vegetables as part of a medley. Others enjoy the popular dish of eggplant curry. Different ethnicities prefer different varieties, depending on how bitter they like the fruit to taste. Eggplant goes back about 2,000 years in the recorded history of India, and there are actually more than 30 Sanskrit names for the fruit in ancient Indian literature. Thomas Jefferson is credited with bringing the fruit to the United States.—By David Elstein, Agricultural Research Service Information Staff. 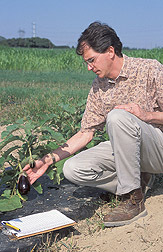 "Scientists Get Under Eggplant's Skin" was published in the January 2004 issue of Agricultural Research magazine.